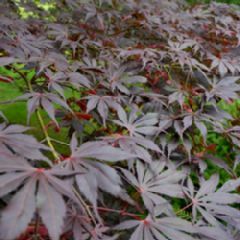 This is a small deciduous tree with exceptionally dark, red-purple foliage and red fruits. The leaves have five main lobes and two minor ones at the base of the leaf: the colour is retained throughout summer with little change in the autumn. It is an elegant and popular maple with a moderately slender upright habit of growth. The red-purple fruits are long-lasting and hang in clusters under the foliage. Height 5m (16ft), Spread 3m (10ft), 10-20 years to maturity.